Lives in Berlin since 1984. Since 2005 Thomas Wiczak studies sculpture and art at the Weissensee Kunsthochschule Berlin. Between 1992 and 2007 he was active as a graffiti writer and street artist. In 2004 he started organizing, curating and coordinating different group projects. During this period he, as set designer, came in touch with theatre and concentrated on different studies, experiments and works in the field of painting, graphics, drawing and calligraphy. Since 2003 he participated in improvisational musical und artistic meetings as a member of the band “Tante Dille” and of the “Ring für Gruppenorganisation” (since 2005) as well as a guest in various performances and worked as a photographer for the Exploratorium Berlin. 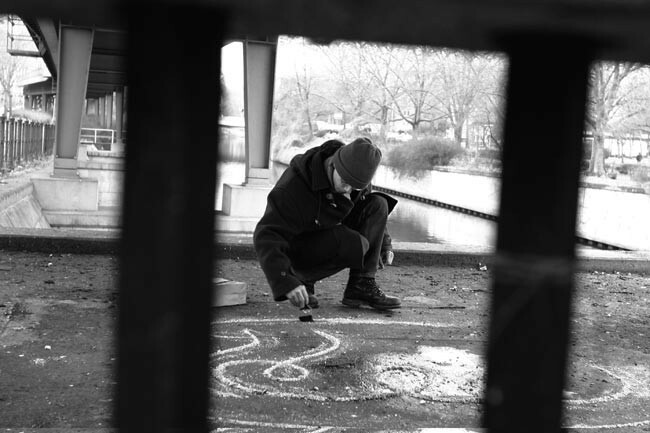 1993-2007 (Graffiti-)writer/sprayer/artist/activist; up to the beginnig of 2007 he worked constantly in Berlin's public space within te context of graffiti/writing and took short trips throughout Germany and foreign countries. A new urban subject, exhibition with Meira Ahmemulic, Galerie Signe Vad, Copenhagen. WETTERSTATION BERLIN, exhibition with Meira Ahmemulic, urban art info, Berlin. Spot City, exhibition in the center of Gothenborg. Artikel 0, exhibition at the Federal Ministry of Justice and the regional court Berlin-Mitte, Berlin. Let there be light, group exhibition, Lulea Konsthallen. Requiem - in memoriam Herwig von Kieseritzky, improvisational performance, Lutherkirche, Berlin. Outsides – Street Art Project, since 05 / 2005 working as organiser & curator of unauthorised group exhibitions in public space, initiated by a major corporation, Wuppertal and Berlin. Current, exhibition and performance with Thomas Naumann, Waschhaus-Galerie Potsdam. Backjumps - THE LIVE ISSUE 2, participation in the project City of Names and Ideomega, work with AKIM, Kunsthaus Bethanien, Berlin. Public 12 hour improvisation, Gießhaus, Kassel. Refugien8, group exhibition, installation with Richard Schwarz, Berlin. B. A., organiser and curator of a group exhibitions in public space. Expect Us, public exchange and exhibition, Zuerich. Artikel 0, Berndt Wilde (ed. ), exhibition catalog (exhibition at Bundesjustizministerium and Landgericht Mitte), editorial function, Berlin 2008.